Masaru Ibuka was born in the city of Nikko, Tochigi Prefecture, Japan, on April 11, 1908. He was a very inquisitive child who was fond of experimenting. One of the earliest short-wave hams in Japan; his calls have been logged in overseas records back in the days of 1926. He graduated from Waseda University, Tokyo, Japan, with the B.S. degree in electrical communications in 1933. His thesis was on an experimental projection-type television system using a nitro-benzol Kerr cell, a pair of Nichol's prisms, and a carbon arc with a rotating mirror wheel. He also conducted experiments on Kerr-cell-modulated light-beam channel distant speech communications, etc. After graduation from Waseda University, he joined Photo-Chemical Laboratories Inc., in Tokyo, where he was engaged in the research into the technology of sound recording on movie films (1933-1937). From 1937 to 1940, he was associated with Nippon-Ko-On (Japan Opto-Acoustic) Industrial Co., Tokyo, and worked on the development and production of home sound movie equipment. 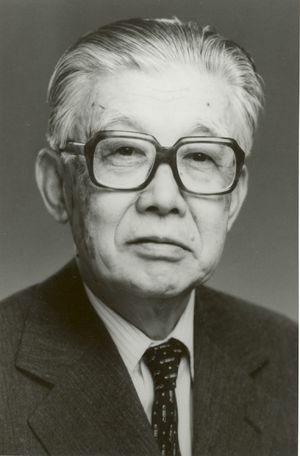 He served as senior managing director of the Japan Measuring Instrument Co., Ltd. from 1940 to 1945, a company engaged in the production of mechanoelectronic frequency-selective relays and other devices for telecommunication systems. In the fall of 1945, he founded Tokyo-Tsushin Kenkyusho (Tokyo Telecommunications Laboratory) Co., which in 1946 was merged into the Tokyo-Tsushin-Kogyo Co., the predecessor of the Sony Corporation. Assuming the post of the managing director in the new company, Mr. Ibuka specialized in telecommunications and educational electronics, as well as in the broadcast studio control, especially magnetic recording equipment. He was elected president of the company in 1950. In 1951 his interest turned to the consumer electronics field following the U.S. invention of the transistor. At that time he visualized the vast future possibilities of the new device. He believed that the transistor , though still in its infancy at that time, showed great promise for the consumer electronics. In 1954 he became the Western Electric Co.'s first licensee of the transistor patent in the Orient. Through considerable hard work, he was able to produce a successful, commercial-quality device the same year. Shortly thereafter, he produced a transistorized broadcast radio receiver. Public reaction was favorable and enthusiastic. This work served to make contemporary industry aware of the potentialities of the transistor. His later efforts involved the transistorization of television receivers, video and sound tape recorders, desk-top calculators, record players, amplifiers and other devices. These developments generally represented breakthroughs in the industry. He also displayed remarkable leadership in utilizing many innovational ideas in solid-state and other electronic and magnetic devices, including work with the Esaki tunnel diode, Yamada magnetosensitive semiconductor diode, polycrystalline monolithic power IC's, and the Trinitron single-gun three-beam color display tube. As Chairman of the Board of the Sony Corporation since 1971, he has contributed many innovational managerial ideas. Mr. Ibuka is a Fellow of IEEE and Vice President. and President proxy of the Invention Association of Japan, as well as a past president of the Institute of Television Engineers of Japan. He is also director or officer of many governmental or nongovernmental organizations in Japan, which include the Electronic Industry Association, Joint Organization of Economic Enterprises of Japan, and others. His many awards include the Medal of Honor with Blue Ribbon from the Emperor of Japan, Medal of Honor from the National Minister of Science & Technology, Export Promotion Prize from the Premier of Japan, and Certificate of Appreciation from the President of the Japan Broadcasting Corporation. Mr. Ibuka was awarded the IEEE Founders Medal in 1972 "For outstanding administrative leadership in applying solid-state devices in consumer electronics, thereby enhancing industry growth and bringing distinction to the profession." This page was last edited on 4 February 2016, at 19:47.